A rare unglamorous, unguarded moment, one F1 would probably not want you to see but in our opinion, precisely the kind of honest, human insight the sport desperately needs. you will have the last 5 dias in Ferrari aired on the 29 and 30. 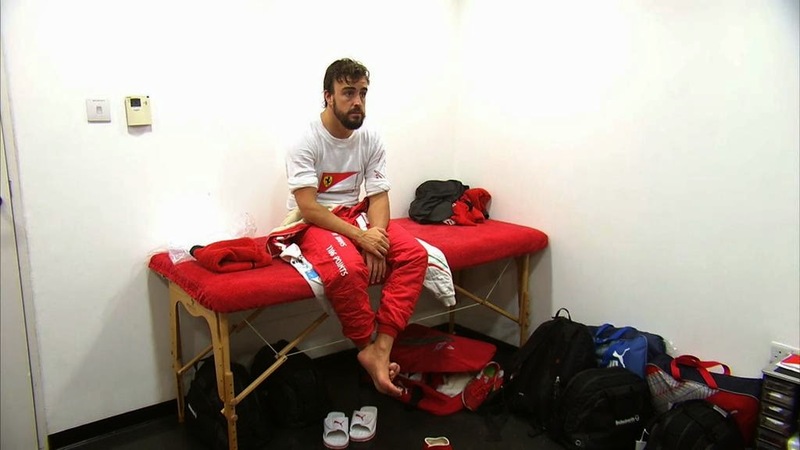 I can't even begin to imagine what Ferrari would be without Alonso. He has singlehandedly saved 'em from complete embarrassment. Normal race fans like us can only imagine the joy and pride of what it feels like to wear the official Ferrari Formula 1 regalia. Of course, the opposite end of the spectrum of emotion is taking off the Ferrari uniform for the last time. Dreams and goals aspired to, but ultimately unfulfilled. Like a once happy marriage that ends in an angry bitter divorce, BOTH parties are left asking, "WTF just happened?!!!!" Fernando's bewildered expression say it all. As a student of the ways of the samuria let's hope he's not contemplating seppuku - he'll want save that for the end of year two at McLaren Honda. A driver can only do so much. No racer wins world titles on his own. It takes a team of ingenious engineers and designers. Upon his arrival at Maranello, Schumi brought his key old-school Benetton homies. They were all united in their work and they developed the car to its maximum. This is why the Schumi Ferrari years are so epic. This simple idea never dawned on Alonso and that is why F1 history will remember him as a quiter. He quit McLaren. He quite Ferrari. And he will quit McLaren again. I just hope there is enough of a personnel shake-up at Ferrari to rejuvenate some life back into their F1 team. Seb's gonna need it. He better not delete Fernando's phone number just yet. Seb might be calling Ferando around Hungary 2016 to get some advise. It is kinda sad alright. I had great hopes that he would win another WC after leaving Renault on a high, always a real statement when you can win with different teams, and tough to walk away from a winning formula...... I admired that at the time.